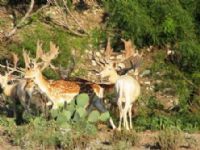 One of the greatest benefits of hunting Fallow deer on a managed game ranch such as Escondido is that you have the benefit of working with highly experienced and professional guides. These individuals can give you personal insight into the best animals available, the best type of shot and even the best techniques for ensuring that you bring home your trophy Fallow buck or doe each and every time you come for a hunt. Guides all have their own secrets as to how to ensure that you will get a shot at the animal you have been waiting for. 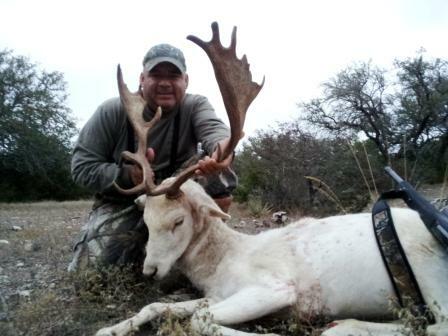 However there are some techniques and tips that are good all round tips to help with hunting Fallow deer and other exotics in Texas. Unlike many of the exotic species and even the native deer species, Fallow deer are very comfortable in open locations when feeding and grazing. This can be used to a hunter's advantage both when hunting from blinds and when hunting by tracking and stalking. Getting into position early, especially when hunting from blinds, is a big factor in preventing these ever vigilant deer from high tailing it into the shelter of the woods surrounding the feeders or open grazing areas. Always being in position early in the morning before the sun starts to rise is going to be a major consideration when hunting. Hunting for mature Fallow bucks which produce palmate antlers that are an excellent addition to any trophy collection. Since the antlers are unique they are great as a head mount. Gentle winters with lots of rain in the spring to produce excellent gazing ensures good body and antler growth, producing those true trophy bucks. 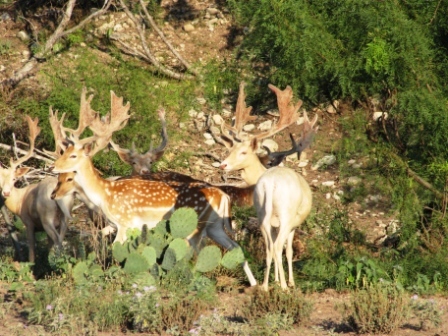 Of course on managed game ranches where numbers are closely monitored and routine feeding occurs the possibility of trophy sized antlers is greatly increased, allowing for some spectacular hunting options. For most hunters in Texas antlers approaching the 28 inch mark in length with the palmate section of the antlers measuring up to 24 inches long are the most prized. Generally bucks will not start to develop the palmate type of antlers until they have reached about 4 years of age. 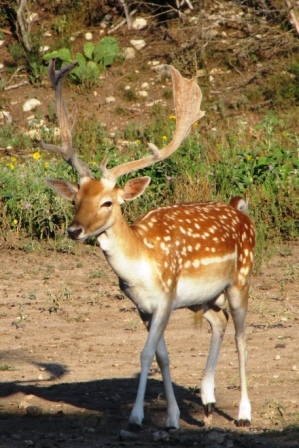 The large antlers of the Fallow deer bucks often seem a bit top heavy for the relatively small bodies. Although a mature buck may weigh up to 200 pounds and measure 48 inches at the shoulder most are smaller than that. This means you do have to be sure of your shot and also be prepared for a fast second shot as these animals are incredibly tough and will get up and run even after a good hit. Since Fallow deer are more random in their movements than whitetail, having an established pattern of movement is going to be more challenging. Blinds that are located along game trails and around feeders are really your best option, but even then hunters have to be quiet, wily and willing to wait until they have a good shot. Typically these animals will react to the slightest sound or scent so it is highly unlikely you will get off another shot if you miss the first time.